Exhall Grange Specialist School and Science College is the ‘data controller’. This means we are responsible for how your personal information is processed and for what purposes. Exhall Grange Specialist School and Science College is registered as the Data Controller with the Information Commissioner’s Office (ICO); Registration Number: Z7827115. You can contact the School as the Data Controller in writing at: Exhall Grange Specialist School and Science College, Easter Way, Ash Green, Coventry, CV7 9HP or admin7000@welearn365.com. 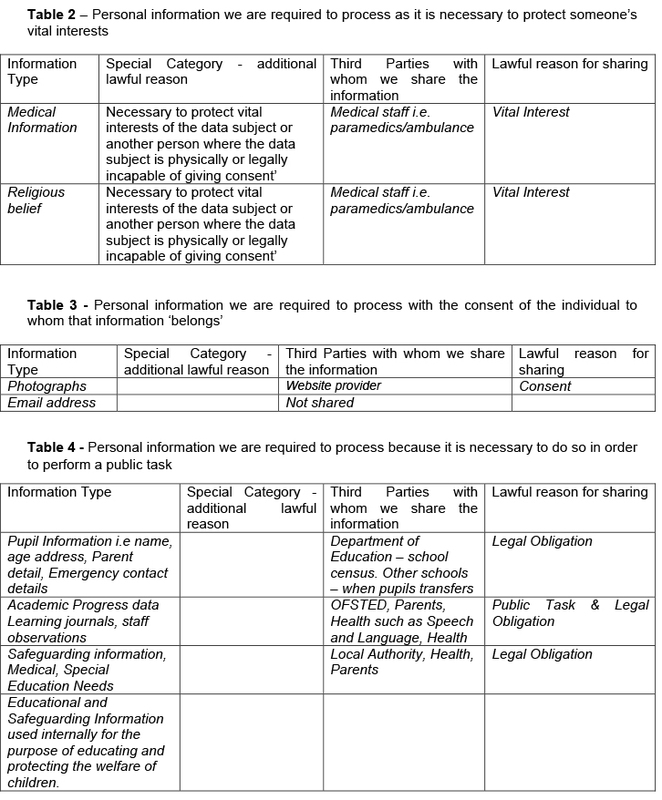 Details of the type of processing that we must undertake, the personal data that is processed, the legislation which requires us to do so and who we may share this information with is set out in Table 1. If you would like a copy of or further information regarding the statutory authorities that underpin our legal obligations, you should contact the School in writing. We are able to process personal information when there is an emergency and/or where a person’s life is in danger. Details of the type of processing that we may undertake on this basis and who we may share that information is set out in Table 2. Whilst much of the personal information processed is in accordance with a legal requirement, there is some personal information that we can only process when we have your consent to do so. In these circumstances, we will provide you with specific and explicit information regarding the reasons the data is being collected and how the data will be used. Details of the type of processing that we may undertake on this basis and who we may share that information is set out in Table 3. It is a day-to-day function of the School to ensure that children receive the education and support they require. 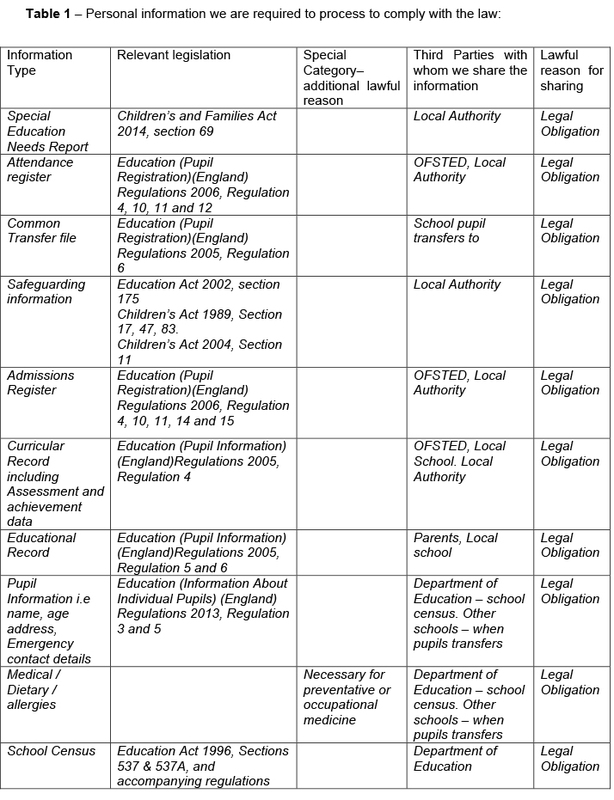 Much of this work is not set out directly in any legislation but it is deemed to be necessary in order to ensure that pupils are properly educated and supported Details of the type of processing that we may undertake on this basis and who we may share that information is set out in Table 4. We do not share information about our pupils or parents unless the law and our policies allow us to do so. Please refer to the tables for information about what personal information is shared with which specific third parties. To find out more about the data collection requirements placed on us by the Department for Education (for example; via the school census) go to https://www.gov.uk/education/data-collectionand-censuses-for-schools. In retaining personal information, the School complies with the Retention Schedules provided by the Information Record Management Society. The schedule s set out the Statutory Provisions under which the School are required to retain the information.